Colt Python 1981 Manual Repair Stations and Colt Letter. 2006 Glock Annual! International Glock Issue! Free shipping! The UTG Side Folding Stock Adapter is an innovative piece. Designed to provide a hybrid between the adjustable style stock and folding style stock, this piece provides the best out of both variants. Made out of anodized Aluminum, this adapter is. 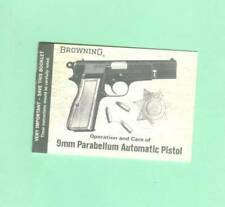 Browning High Power 9mm Parabellum Automatic Pistol early instruction manual - NOT AN ORIGINAL. Made with quality scans of an original. Twelve pages coving Operation and Care of this fine pistol. I only use archival inks also. High quality vintage pin, extremely hard to find the new old stock collectable vintage pin. The picture speaks for the top condition. Buy while available, going fast. I have several if you want more than 1. Mark 23 Pistol. Operators Manual. 48 page 5x8" manual. Manual is in very good condition with slight "dog ear" edge on back cover. Warranty cards show age discoloration of paper. Print code on back cover is "Revised 6/93" and "Revolver Manual #03648". Manual for the Browning Hi Power, P35, FN Herstal. Includes operational details, field stripping information and general data. Reprint of the Fabrique Nationale factory manual. Illustrated, 32 pages, 5-1/2 x 8-1/2. Made with high quality scans of original. Three languages, English, Spanish and Portuguese. Fairly simplistic but good information and nice for display. I only use archival inks also. 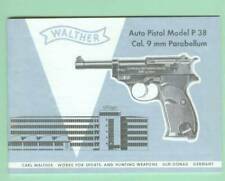 19 page owners manual covering Beretta 81 and 84 Pistols. 19 page 5x8"manual. You'll get unsurpassed protection for your rails and safeguard hands with the Leapers UTG Low Profile Max Security Polymer Rubber Rail Guard. This Leapers 12 Piece UTG Low Profile Max Security Rubber Rail Guard features a streamlined surface contour. Winchester Model 71 Manual Original! 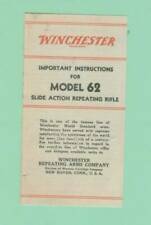 Winchester Model 71 Manual Original!. Condition is Used. Shipped with USPS First Class Package. DPMS Panther Arms Sticker (New). Condition is New. Shipped with USPS First Class Package. HS factory instruction manual - NOT AN ORIGINAL for the 21 and 21S Models. Made with quality scans of an original - NOT AN ORIGINAL. 8 ½" x 11" four page layout. Complete parts diagram and detailed parts list plus instructions for use in English and I believe German. Overall in excellent condition. Pretty much what you would expect to see from a 30 year old manual. Erma KGP 69 instruction manual - NOT AN ORIGINAL. Printed with high resolution scans of an original. Printed at the correct size in full color. Great information and a nice display item. I only use archival inks also. Cover all current Glocks even the slimline Glocks 42 and 43. Remington Nylon 66 1970’s Factory Instruction Manual - NOT AN ORIGINAL. Printed with quality scans of an original and Printed in full color on correct weight paper at the correct size. Eight page staple bound format. Colt Vest Pocket. 25 1908 EARLY pistol factory owners instruction manual – NOT AN ORIGINAL. Printed from high resolution scans of an original with natural ing captured for enhanced display value. Printed at the correct size in full color. Deck your weapon out with the UTG Model Combat Sniper and Pistol Grip. With it's ergonomic design, you can fire every shot with comfort and accuracy. The Hi-tech non-slip, Impact Resistant Advanced Polymer material keeps the weapon steady and reduces. Colt Woodsman Series 2 factory instruction manual - NOT AN ORIGINAL. Printed with high resolution scans of an original. Printed on correct weight papers at the correct size in full color. Great information and a nice display item. Remington's Field Service Manual for the Nylon 66 rifle. The manual contains 42 pages covering components, assembly, malfunctions, exploded view and parts. It also contains a 2 page quick reference for maintenance. Charter Arms AR-7 instruction manual - NOT AN ORIGINAL. Printed from an original with high quality digital scans. The manual consists of 8 pages counting covers and has several pictures and covers assembly and disassembly, care, safety, a parts list and parts diagram and warranty. Made with quality scans of an original. Fairly simplistic but good information and a nice addition to your rifle. No reserve. I only use archival inks also. Colt Pocket. 32 ACP &. 380 ACP 1903 Model Automatic Pistol factory instruction manual - NOT AN ORIGINAL. Made with quality scans of an original. Four pages covering safety, disassembly, reassembly, a parts diagram and list plus great text on this fine old pistol. Colt Huntsman 1970’s Factory Manual - NOT AN ORIGINAL. Made with quality scans of an original and printed on correct weight paper in full color at the correct size. Great information and a nice display item. It is a PDF File on a Computer Compact Disk (CD). It covers all aspects of the Colt 45. It is 208 pages long and fully illustrated. You can keep the manual on your computer or print any pages you need. Made with high quality scans of original with originals aged look intact. Great information and a nice addition to your rifle. No reserve. Good information but just the basics. Still nice to have with your firearm and a nice display item. Beretta 70 series factory instruction manual sheet - NOT AN ORIGINAL. Made with quality scans of an original. Text and many pictures covering the model 70, 71, 72, 73, 74 and 75. The manual is in English and several other languages. This is a great original piece of Colt Industries and Colt Firearms Division paperwork. This 1966 dated Colt Frontier Scout Owner's Manual is designed to help you with loading, firing, correct care and/or parts. Made with quality scans of an original. Covers disassembly, assembly, operation and care. Tri-fold design Printed with the aged look of the original. Great information and a nice display item. No reserve. 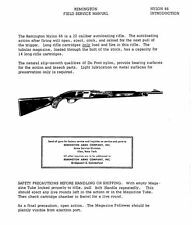 Remington Model 17 factory instruction manual - NOT AN ORIGINAL. Printed with quality scans of an original. Eight page staple bound format with pictures and text covering foreword, specifications, operation, dismounting and assembling, sectional views, care, plus a parts list and parts diagram. 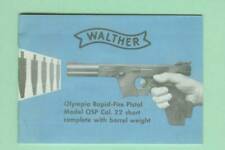 ***** NOT A COPY OR REPRODUCTION ***** NEW factory Beretta manual for model 1200 F shotguns. See photo. 35 pages. 8.25" x 5.75". Printed in Italy. Three languages: Italian / English / French. 1st Class and Priority Mail shipping. 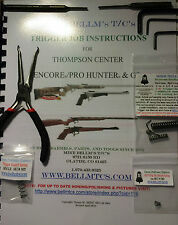 See my other Beretta manual listings and other auction listings. 9 Shot Top Breaking Revolver. H&R Sportsman Model 999. However this manual is over all a very clean print. This reproduction manual has chapters and instructions for ~ Printed and folded manual~. This manual is. Reproduction Firearms Manuals Lot of (6) Nice LOOK! !